Everywhere we look, our friends on the right are under attack. Dinesh D’Souza is being charged with multiple felonies for an alleged chickenfeed campaign finance violation. Mark Steyn and National Review are being sued. Organizers of conservative grass roots groups like Catherine Engelbrecht are being harassed by federal agencies including IRS, OSHA, FBI and EPA. Various conservatives of our acquaintance, who will remain nameless to protect the innocent, are being audited by the IRS or subjected to unspecified criminal “investigations” by partisan U.S. Attorneys. Charles and David Koch have been subjected to a campaign of vilification unprecedented in our history. And that is before we get to the Obama administration’s just-launched effort to use the FCC to shut down conservatives in radio and television (about which, more later today, or maybe tomorrow). Here is a prediction: the four senators will never get coherent answers to their questions. 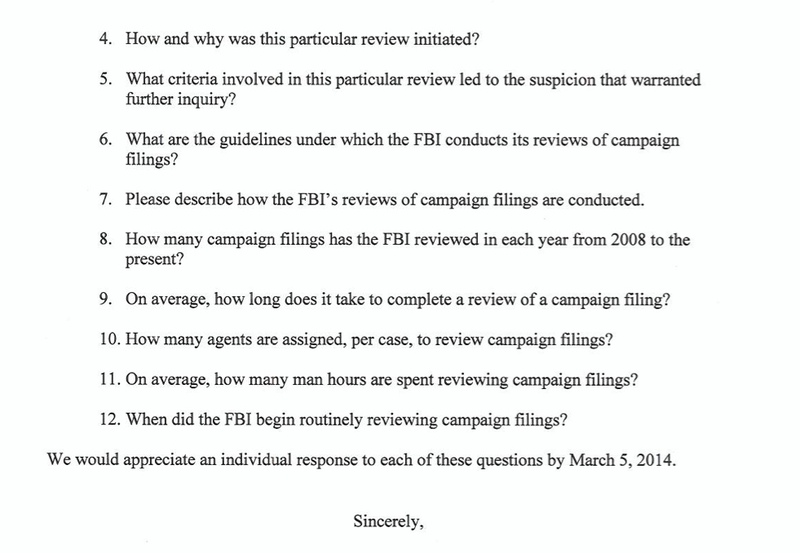 In particular, they will never get a truthful answer to question number four, “How and why was this particular review initiated?” I think the U.S. Attorney’s claim that D’Souza’s prosecution resulted from a “routine review” of FEC filings by FBI agents was a lie, for these reasons: 1) I don’t believe that the FBI carries out such “routine reviews.” 2) Routinely reviewing FEC filings would be a colossal waste of time for FBI agents. 3) A “routine review” of filings relating to the New York Senate race in question would not have generated any suspicion with regard to D’Souza. The violation with which he is charged would not have been revealed by a “routine review,” but would have required further digging to discover relationships between D’Souza and the friends for whom he allegedly reimbursed campaign donations. 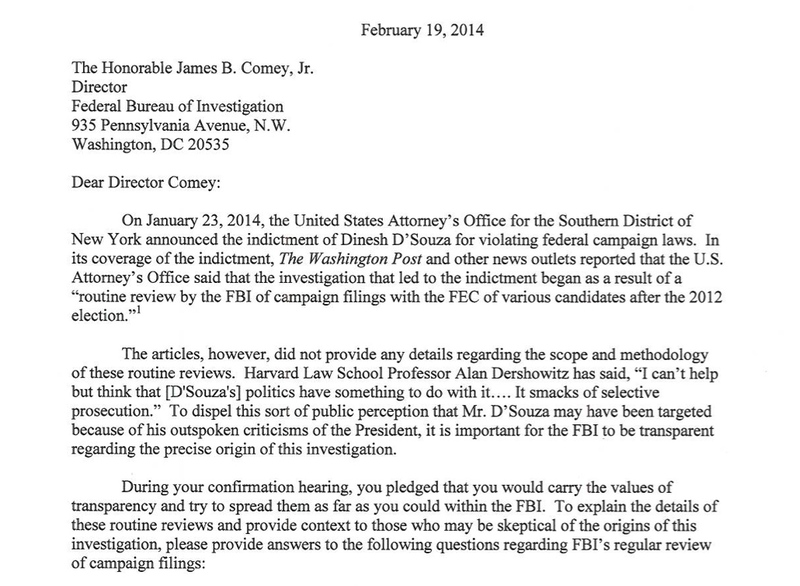 4) Felony prosecutions for the sort of violation with which D’Souza is charged are unheard of. 5) If the FBI conducted a “routine review” of contributions to President Obama’s 2008 and 2012 campaigns, particularly online donations, they would find many obvious violations, like my contribution in the name of “Illegal Contributor,” residence, Stillwater State Prison, Stillwater, Minnesota–a donation that was returned by the Obama campaign after I wrote about it here on Power Line. Mine was one of many contributions to the Obama campaign, the illegality of which would, in fact, be disclosed by a “routine review.” Yet there have been no prosecutions arising out of any such investigation, because there has been no such investigation. I think the U.S. Attorney’s prosecution of Dinesh D’Souza is politically motivated and is intended to punish D’Souza for criticizing Barack Obama. I think the White House directed the U.S. Attorney to try to find something on D’Souza, and that considerable federal resources were consumed in digging up the campaign violation that is now alleged. (Alternatively, it is possible that the U.S. Attorney acted on his own as a partisan Democrat, without specific direction from the White House, but with the intention of pleasing the president by attacking his critics.) But don’t expect to learn the truth from whatever evasive response Director Comey eventually makes to the four senators’ questions.